Recommand to read the whole series. I just read and copy the contents to the note :). LXD is an extended version of LXC (LinuX Container). LXD prvoides REST API and easy-to-use interface to control containers. LXD is written by go and uses LXC share library (liblxc) directly. LXD can provoide live migration with criu (LXC can not). The major purpose of LXD/ LXC is to provide VM-like environment. You can control container just like you control VM before. Unlike Docker, you can use systemd in the lxd container. LXD also provides well-defined networking interface. I test the lxd in ubuntu 16.04 and 16.10. The versions of ubuntu 16.04 and 16.10 are 2.0.7 and 2.4.0. The latest version (2017/03/06) is 2.10. After LXD 2.3.0, it has new commands lxd network. You can get more details from the article. If you have need to use lxd network command, you can build lxd by yourself. It's not difficult to build. Otherwise you can just use package from package manager. You can install lxc and lxc both since the two command line interfaces are independent. The commands of LXD are lxc and lxd. The commands of LXD is started wtih lxc-. It's uneeded to use them in the same time. # sudo apt install -y criu  # Support live migration. Check the lxd dameon executing successfully. (Optional) Lauch the lxd daemon after reboot automatically. lxc launch ubuntu:16.04 yen3-ubuntu    # Init and start the container named `yen3-ubuntu`. # As the bellow but with `default` and `yen3` two profiles. lxc list                               # List the status of all containers. lxc stop yen3-ubuntu --stateful        # Stop the container and save the state (need to `sudo apt install -y criu`). # The function maybe not work. lxc config show default                # Show default config. Before use the lxd, I only have a little knowledge about network setting. If you are very familar with network setting, you can ignore the section. After LXD 2.3, LXD provoides lxd network command, you can read the article to get more details. I would not discuss how to use the command here. I just learn and write the basic usage. The default networking setting of LXD container is bridge mode. Beside the mode, LXD provides physical, vlan and macvlan modes. physical: Use the host NIC directly. vlan: I have no idea how to use vlan Xd. 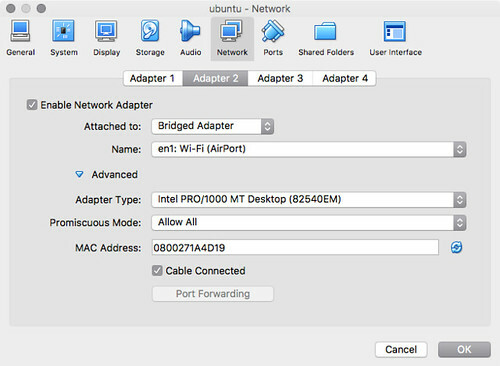 macvlan: Simulate a different mac address based on a host NIC. The NIC conntects to host directly. I take examples to use physical and macvlan. Assume the container's name is c1 and the enp0s8 NIC is unused in the host. Add a NIC named eth1 to use enp0s8 and restart it. Exec lxc exec 1 -- ip addr to check the setting is successfully. (Optional) Assume the outer network setting is DHCP, I just set eth1 with DHCP and restart networking service. Restart the networking service and check the NIC setting. I setup a VirtualBox VM to practice the mode. The NIC has to allow all connection or it is not valid after setting. Assume the container's name is c1 and the enp0s3 is in the host. (Optional) We can also set the NIC with DHCP as the below to check the status of NIC. $ curl -s -k --cert ~/.config/lxc/client.crt --key ~/.config/lxc/client.key https://127.0.0.1:8443/1.0/containers | jq . LXC uses the feature to implement. Generate an profile to mount your home dir to container with host's uid.